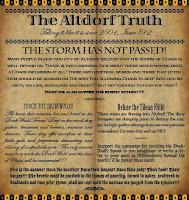 The other day I was reading Jadrax’s comment to my latest issue of The Altdorf Truth. He mentioned that he thought these pamphlets would come in handy when the Pamphleteer career is released in Shadows over Empire, and I thought that’s probably right, but what if people don’t want my storylines, or aren’t playing in Altdorf? So I put together a simple HTML tool to assist Gamemasters and players all over the world to create their own pamphlets in the style of The Altdorf Truth. It’s nothing fancy or advanced, but I imagine it can be a lot of fun nevertheless. How it works is simple. Open the page and write your own newssheet in the boxes. Then print it out. That’s it. Please report any problems to me by posting in the comments! My skills at programming are severely limited, so I don’t know how to create a save function … but a guy I know does, so this beta will be further developed as time permits! For now, you’ll have to make do with the first beta release of … The Pamphlet Template! Thanks to Jadrax for sparking this idea!